I have a pin I’ve been wanting to make for a long time. Okay, fine. I have several pins that are still waiting for me to get to them. But this one was something useful for the trip so I really wanted to get it done. One problem. I can’t get the link to open so no access to a tutorial. So I had to make it up as I went. I measured the space between the two car seats and I cut out the base. Then, pockets. 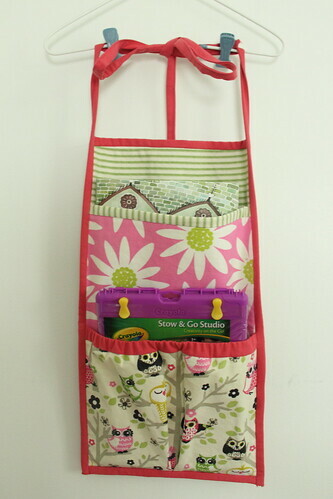 I wanted a gathered pocket with an elastic on the bottom to hold something bulkier, pockets for books, and pockets for crayons/pencils/markers. But my tired brain just wasn’t willing to think. No thinking about an appropriate size for the pockets, no thinking about the number of pockets, no thinking about the placement of the pockets. No thinking. So I ended up with this. Sorry I have no pictures in the car. The car is in a state. There’s food or something that’s going bad in there and the smell is so bad it would have come through in a picture. Yes, Mr. Mouse is having it cleaned as I write. Two pockets. The bottom one is gathered at least. Took me forever to find a book that wouldn’t sink completely into the pocket on top. I could probably have made that pocket shallower and put in two. The bottom one is close to perfect though. I had a hard time gathering the bottom so I pleated it instead. Who would have known that two layers of home dec fabric + one layer of craft fuse would be so stiff! I can fit two drawing cases in that pocket with room for spare markers. Not too shabby. I thought of adding buttons somewhere and making additional detachable pockets but at some point, everyone needs to sleep.